LotsaLoot is a unique online progressive slot machine developed by Microgaming, the leader in online casino and Internet gaming software. The greatest feature of this game is that the Lots-A-Loot symbol is wild and acts as a win multiplier. The slot machine has become very popular and we see more and more progressive jackpot winners every month. Lotsaloot is a $0.25 cent, 3 reel slot with a 5 line payout and is connected to multiple casinos powered by Microgaming's advanced casino systems. You must play the max bet (5 coins or $2.5) each spin to have a chance of winning progressive jackpot. Moreover, the best jackpots apart from the progressive, start at the fourth pay line smaller as they move through to the first pay line. So even if you do not hit large progressive jackpot you will increase your chances to get some smaller winnings. A new 5-reel version of Lotsaloot progressive is available now at all participating online casinos (see image below). The additional 20 paylines ensure that the new game has one of the highest hit rates in the Microgaming video slot range. Both the original and new versions feed into the same progressive pot (Jackpot Madness). LotsaLoot is available at large number of Microgaming online casinos. However, we would recommend you join Jackpot City, that is offering a $2000 bonus to any player who hits a jackpot of any size while playing their progressives. All new players receive $50 free cash (or 50 Euros, or 50 Pounds). 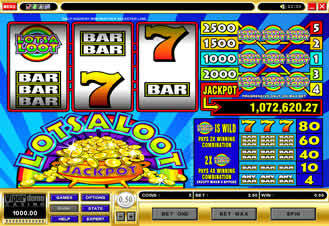 LotsaLoot online progressive slot has paid out $351,985.14 to a total of 17 jackpot winners in August 2005 alone! The largest August winner was Andrew S who won $46,511.84 at The Gaming Club casino. You can see more LotsaLoot winners and their stories and interviews here.